The 280,946 square-foot complex was voted on by the student body. Texas Tech University officials gathered at the John Walker Soccer Complex, located near 10th Street and Texas Tech Parkway. 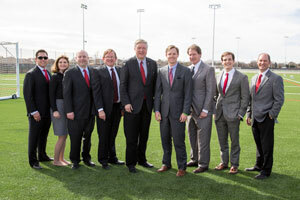 Texas Tech University officials gathered near the John Walker Soccer Complex on Friday (Feb. 20) to unveil Recreational Sports' new West Rec Turf Field Complex. 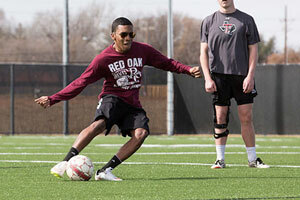 The 280,946 square-foot complex, located near 10th Street and Texas Tech Parkway, is composed of four flag football fields, recreational soccer space and a student group meeting area. Texas Tech President M. Duane Nellis says this new complex is a great addition to the university, regarding healthy living among the student body. Students will be able to play intramural games, tournaments, flag football, soccer and men and women's lacrosse at the new complex. The complex is scheduled to open later this month. The West Rec Turf Field complex was voted for by Texas Tech students in October 2013, and the planning process began late last year. The complex is being paid for by student fees. Students will be able to play intramural games, tournaments, flag football, soccer and men and women's lacrosse at the new complex. Texas Tech's Vice Chancellor of Facilities Planning and Construction Michael Molina commended the great teamwork displayed during the design and construction of the complex. “This project is a great example of teamwork between all facets of the Texas Tech University System and Texas Tech,” he said. “The project was designed and constructed in less than 100 days and delivered under budget. The quality of the work is outstanding. Recreational Sports will announce the upcoming opportunities for students to participate in events at the complex at a later date.